In its 2010 annual report, Pakistan Telecommunication Authority (PTA) announced that wi-tribe Pakistan successfully ranked number one in both the ‘Technology Neutral’ and ‘Wireless’ categories for highest Quality of Service, despite being the youngest broadband company, said a statement issued by the company today. PTA’s acknowledgment of wi-tribe’s service quality emphasizes that the company is passionate about delivering nothing short of excellence to its customers. 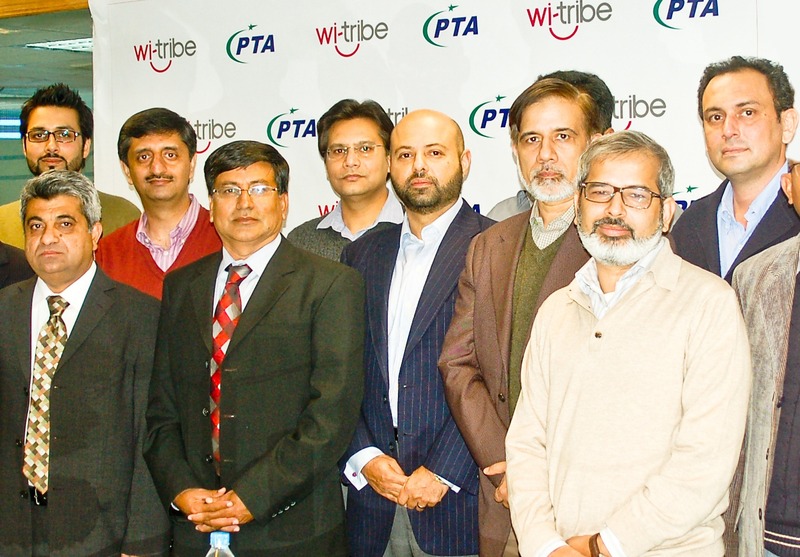 To celebrate this achievement, PTA Chairman, Dr. Mohammed Yaseen, was invited by wi-tribe Pakistan’s CEO, Mustafa Peracha and his team for a cake-cutting ceremony at wi-tribe’s head office in Islamabad. In addition to recognizing wi-tribe’s quality-driven approach, the report also concluded that wi-tribe is the fastest growing broadband operator in Pakistan, successfully delivering high speed internet to customers in all its cities of operation. During the last five years, Pakistan’s broadband subscriber base has increased by leaps and bounds. People from all walks of life, including professionals, students, academics and corporates are all finding high speed internet to be essential towards their respective progression. wi-tribe realizes the need to serve growing demands, with no compromise on quality of service. With a focus on delivering high quality broadband internet across its network of operations, wi-tribe enables instant connectivity with its plug ‘n’ play devices, offering the latest in affordable internet technology. I am user of Wi-tribe from the launched, i am satisfied and decision is good for the number 1. Don’t tell a lie they are fraud company in pakistan and they are just eating money like a dog they cheated me as well. Yar ye kaisy number 1 ho saktay hain? ?Apna Network coverage barhayen phir daikhtay hain kaun aata hai number 1 per. I blieve u r ryt propakistani brcause i have used it and m gona buy a new connection very soon…. There website is not accessible for many days. Try to visit it. It gives cgi error. Always think in negative way, never praise or appreciate good things @ ahmad.Illiteracy is one of our main problem. Hope all of us should have good knowledge of everything, before we comment, my dear there are certain parameters and benchmark on the basis of which PTA selects which operator/company is good, Think before u post such comments. Mr. Expert. Be informed that this company is a pack of scums. They are caching ALL websites via their proxy servers. I had a month long stand off with them. In the end, they admitted their caching practices BUT never gave me anything in black and white. Remember. The losers at PTA did nothing special to judge this company. They just counted the number of complaints received by them. Thats pretty much about it. If admins are reading my message, dont delete. Instead, let me know if you are ready to publish proof on your site. An how do you think proxy-ing and caching falls under “bad practices” by ISPs. To my knowledge every Internet company caches the traffic to produce better and fast delivery of web traffic to their subscribers. The pages which require frequent updates, the websites parse a tag through which either the content doesn’t get cached or frequently updated. Wi-Tribe was a tumbling ship prior new leadership; this is truly an achievement by Mr. Mustafa Peracha & his team. Gentleman is rightly LEADING the company to take advantage of the untapped broadband opportunity in the country. I don’t think they bribed the PTA. They are good and upcoming company. Can somebody send details on whom runner up were? And who gave PTA the mandate to sell other companies’ products? Witribe is a good company but how many cities is it operating? is it comparable to PTCL? is it wise to rank service providers with a biased criteria and then lure the consumers? PTA has always been drum beating wimax services and what is the size of wimax in Pakistan? maximum of 250,000 active subs? I agree with you. I will not crytisize the company since I appreciate their effort to grow themselves. I have been customer of PTCL since two and a half year and I rairly had any complain with them. I think they need to improve their customer service; and their working power to deliver the good services. If I was the chairman of PTA, I will have ranked either Wateen or PTCL as the grooming companies taking their customers’ copasities into account. Wi-tribe’s service will be fantastic until they are limited to few cities. But think of Wateen–they work flawlesly and if one understands the fact of over capacitating the system and what happens after that, they will surely going to go to vote to PTCL or Wateen. With some suggestions to improve their systems. Y v all think pessimistically. wi-tribe suffered heavy losses in 2010. Revenues are much less than CAPEX and OPEX since 2008. Their tariffs are so low that they cannot recover their CPE cost alone, forget the OPEX including HR and infrastructure? If bleeding continues like this, wi-tribe will be bankrupt within the next 2 years unless it gets new investment. @ Amir please show thw whole chart of qos survey so that we can find the positions of all operators in the list. @Ali, With an ____ like Baig as VP HR, you cannot expect good HR policies. Just like Witribe replaced the whole management including Group CEO, Witribe needs a new VP HR. May be Paracha should consider bringing Ali , previous VP HR of Mobilink. A company like Wi-Tribe is a tip of an iceberge. It has much more capacity to absorb initial loses; These are in fact investment periods for such IT&T companies, it invests in infrastructure, setup, Human Resource, customer care and just everything. QTEL stepped in a right way, they are growing their child Wi-Tribe very carefully and with prosperity. Once the child grow up, it will not only cover its pocket money but will also payback to parents and will grow multi directions. So what are you talking about bankruptcy? Please think before you leap. Think of Zong, Telenor, Warid… they didnt invest heavily to go bankrupt, they are all facing same troubles, more expenses, loses, competition, heavy infrastructure investments…They all jumped in to stay and to compete for their share; and all will survive as they are all children of wealthy rich parents.